The Swatch Bellamy will come with NFC payment capabilities. Paying for goods with a swipe of a phone or a smartwatch is something we're all gradually getting more accustomed to, and venerable watchmaker Swatch wants a part of this brave new world too – it's just announced a partnership with Visa for wrist-based mobile payments. The capability is going to come integrated into Swatch's forthcoming Bellamy watch. The usual NFC (Near Field Communication) technology will be front and centre, enabling you to pay at supporting retailers with a tap via a connected Visa account. The launch is going to be somewhat limited in its early stages, however: Reuters reports that cardholders in the United States, Switzerland and Brazil are going to be the first to be able to take advantage of the new technology. We'd expect more countries to be added to that list eventually, but for now there's no word on an international expansion. The Bellamy is a simple smartwatch – we already knew it had NFC capabilities, but today's announcement confirms that mobile payments are going to be part of the deal. In fact, it looks like paying for goods and services will be the wearable's most significant feature. We know China will be getting the watch first in January 2016, with other countries to follow. As yet there are no details on pricing, but we'll let you know as soon as something leaks down the grapevine. 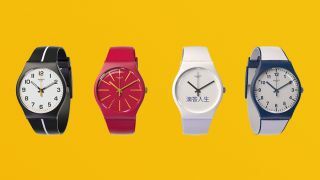 It's not clear yet what kind of security protocols will be in place to keep your Visa details safe, but Swatch has said the Bellamy's battery life will be comparable to that of its regular range of watches; i.e. very good. So it's perhaps a smartwatch to bear in mind if you want a traditional-looking watch with mobile payment capabilities, but no distracting notifications.